APGCL Recruitment 2018 : Welcome to another job article in Assam Career. 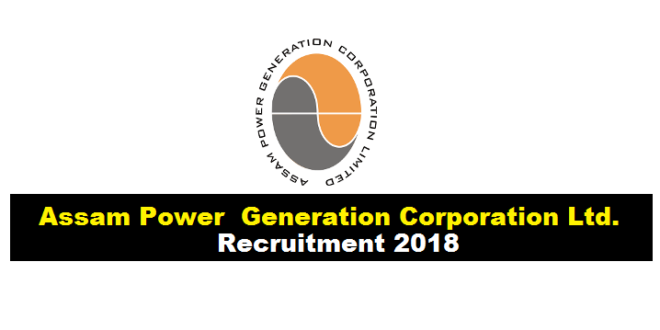 We are here to notify you a new Govt Job in Assam at Assam Power Generation Corporation Limited [APGCL] . We know that Assam Power Generation Corporation Limited, a Public Sector Company registered under ‘Company Act, 1956’ formed out of restructured Assam State Electricity Board in 2003 and was notified as the State Generation Utility (SGU). According to the latest APGCL Recruitment 2018 notification, APGCL invites applications from the dynamic and experienced professionals in Finance and Accounts for filling up the post of the Chief General Manager (F&A) at Assam Power Generation Corporation Limited. We have discussed about this sarkari sakori in the following section. In this section, we will mention each and every details about the Recruitment of CGM Post Under APGCL Assam Recruitment 2018 with all the details and requirements . Age Limit: Internal candidates: 50 to 57 years; Others: 50 to 55 years. Candidate must have a degree from a Govt. recognized university and should be a Chartered Accountant or a Cost Accountant. Paltan Bazar, Guwahati – 781001. Mode of Selection : The candidate will have to appear before the selection committee of APGCL at Guwahati at their own cost. The applications in the prescribed format of the eligible departmental candidates must be routed “Through Proper Channel”. 1/ Applicants working in Govt./Semi-Govt./Public Undertakings/Statutory Bodies should produce ‘No Objection Certificate’ from their present employer along with the application, failing which his/her candidature will not be considered. 2/ Caste Certificates of SC/ST/OBC/MOBC should have been issued by the competent Authority. 3/ Incomplete application/ application without requisite enclosures/photograph/ demand draft of application fee/ application not fulfilling the eligibility criteria will be summarily rejected. No communication in this regard shall be entertained by APGCL. 4/ Canvassing directly or indirectly shall disqualify the candidature. 5/ APGCL reserves the right to cancel this advertisement without any prior notice to the candidates.